Steve Roach and Jorge Reyes — both considered pioneers in neo-shamanic, ethno tribal ambient music — release their first collaboration CD, nearly 4 years in the making. This recording captures a pure, organic sound that is rich with the potent magical atmosphere central to their music in both solo and group settings. Remote and mysterious locations in the deep of Mexico’s historic landscape, as well as the hallucinogenic terrain of the Sonoran desert in Southern Arizona, provide the ground which this music takes place upon. A surreal blending of acoustic and electronic instruments — along with voice and location recordings — create this musical elixir, one of strong shamanic undercurrents. 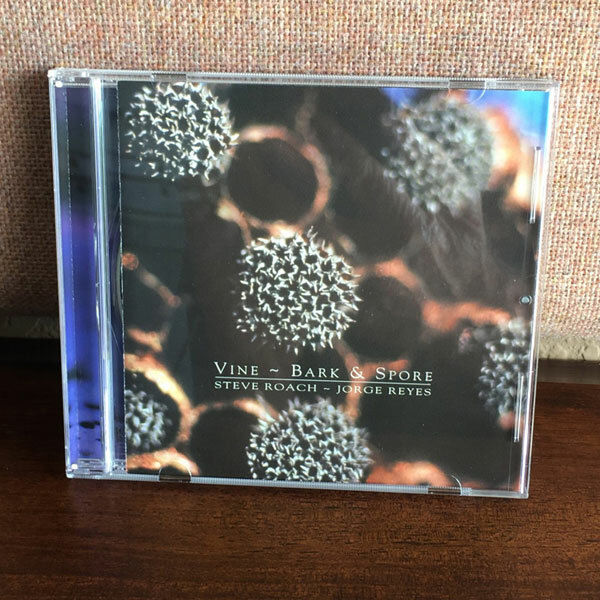 With the intention of creating an opening to step through time and again, Vine ~ Bark & Spore offers music as the medicine for the soul. This disc is an essential record of why the music of Roach and Reyes acts as a transmitter of the attitudes that ancient cultures had towards music and the spiritual aspects of life while merging with the currents of today. 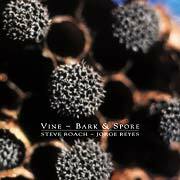 Steve Roach and Jorges Reyes have recorded numerous recordings as solo and group artists including 2 acclaimed releases under the name Suspended Memories with Madrid based guitarist Suso Saiz. Their 1994 release Earth Island won the Indie Award by AFIM for the Electronic Instrumental – Ambient category, an award equal to the Grammy in the independent music world. Both artists perform consistently in festivals and unique concert settings worldwide, such as the Jameos Del Agua, a theater in a volcanic cave on the Island of Lanzarote where Steve and Jorge first met in 1991. Their mutual intentions were soon realized when they were invited to play a spontaneous concert after having just met a few hours before. This set the tone for an on going musical relationship that has always been about capturing an on-the-edge feeling of pure emotion delivered with ceremonial intensity , mixing improvisation and compositional forms with a compelling list of instruments ranging from the Pre-Hispanic roots of Jorge in Mexico and Steve’s constant innovations with electronic and acoustic instruments. Together they create a music that goes beyond any current category and have found an audience worldwide that understands its timeless allure. Every so often there is a release that builds in anticipation throughout the New Music contingency. There was, with the first inklings of Vine, Bark & Spore on the horizon, a great deal of propitious whisperings. A growing number of fans have discovered the music of “The Electronic Nestor”, Steve Roach. In fact his opus, The Magnificent Void came in at number one in a recent polling of hard-core Electronica fans worldwide. Many newcomers may not yet be familiar with the shamanistic rituals of Jorge Reyes, the (un)official legate of Mexican artists, a conjurer of mystical sound who has created some of the finest tribal/ritual new music in the world. Lately, his presence has not been as strong as in the early 90’s; the last taste was a track on the SOLAR compilation, his first studio recording in four years. The combination of all the aforementioned elements makes for a release of practically historic proportions. The good news is that Vine, Bark & Spore lives up to the preamble, and in our opinion surpassed expectations to a large degree. The tactile recording quality only adds to the magic of the music. This is, after all, a Timeroom production, which nowadays seems to be synonymous with the highest order of sonic attributes. Roach’s studio employs only the finest gear for both recording and playback, allowing Steve to personally fine-tune the project at each step of the process. Musically, the recording vacillates between Roach’s beautiful, brilliant ambient works made popular with The Magnificent Void, Atmospheric Conditions, Slow Heat, and the work of Suspended Memories – of whom both musicians numbered among the alumni, along with Spain’s Suso Saiz on “hypnotic guitar”. The music on Vine, Bark & Spore, as the title suggests, retains a distinct organic presence with no “glitched-out” crackling, pops or distortions. Instead the work is of smooth, even natural music – almost cinematic in scope. Drifting waves of droning synch is built layer upon layer, which when you are seated directly between your speakers, fill the listening space from front to back – amazingly recreating a sense of depth that extends far beyond the walls. Reyes, known for his collection of thousands of ancient, original ethnic instruments adds another dimension by subtly applying various shakers, drums and other sundry implements. The real magic intensifies when Reyes adds his extraordinary chant. There are no other musicians that can replicate this patented sound, and the result is mind-shattering. Where other recordings may include that one off-key element that seems out of place or anomalous, these duos are spot-on as if the pieces of a giant jigsaw puzzle came together to form a perfect whole. The tendency to go overboard by the accumulation of too many disparate ideas is instead just the contrary. There is keen sense the listener experiences, one of the artists holding back and restraint, which makes the music even more suspenseful. The fact that these artists have expurgated anything that doesn’t belong only makes the CD that much more engaging. Those in attendance on the initial listening session were sitting, slack-jawed, as if experiencing music for the first time. There were no off color remarks or criticisms either, which is highly unusual for the crew at RagConEast’s ‘”Sanctuary”, where someone always finds a flaw to complain about. Anyone who loves ambient/tribal/ritualistic electronics will cherish this special recording. The fact that this is a sonic spectacular you will play to the amusement of friends is only a plus, placing this immediately into “instant classic” status.